Dr. Grant Golden, MD was presented with an award from the Catholic Health System for being one of the 2011 Top Docs recognized in Buffalo Spree Magazine! 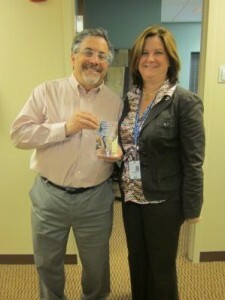 Seton Imaging’s Director of Mammography, Grant Golden, MD was acknowledged by the Catholic Health System with the presentation of an award for being recognized by Buffalo Spree Magazine as one of the “2011 Top Docs”. The Top Docs listing was published in the January/February 2011 edition of Buffalo Spree Magazine and can also be viewed online at http://www.buffalospree.com/Buffalo-Spree/Top-Doctors/index.php. Caroline Raimy, Physician Liaison for Catholic Health System/Kenmore Mercy Hospital made the presentation at Seton Imaging’s main office in Amherst.